But, like so many bookshops, Bennett's has become a 'casualty of the high street' - it's strapped for cash and going to be torn down. Paige is determined to save it but mobilising a small town like Greysworth is no mean feat.Time is ticking - but that's not the only problem Paige has. How is she going to fend off the attractions of beautiful fellow artist, Blaine? And, more importantly, will his anarchist ways make or break her bookshop campaign? Bookshop Girl is the perfect quick, summer read! It's light-hearted and fun and let's be honest, it doesn't get much better than a book about a bookshop does it?! Paige Turner works in her local bookshop, Bennett's. When the news breaks that the shop is to be shut down, Paige and her friend Holly refuse to let Bennett's close without a fight and they start a petition to save the shop. Bookshop Girl is an brilliant story about how you can make things happen when you try! Paige and Holly are constantly faced with people being negative about their ability to make change and yet they don't let that stop them (little bit of female empowerment in there too yes please!!). There's some romance and whathaveyou but books and friendship are the main focus of the story which made this the perfect book for me! I am a big fan of contemporary books (obvs) but sometimes it can be hard to find a story that's not centred on romantic relationships and so I appreciate this all the more! Anyway, my desire for more pages will soon be fulfilled and I'm super excited that there is a book two!! I cannot wait to see what Paige and Holly get up to next. 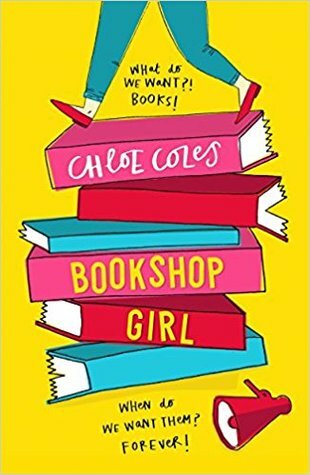 If you're looking for a fun summer read then definitely pick up Bookshop Girl you will not be disappointed! Have you read Bookshop Girl? Or are you planning to!? Let me know in a comment below or hit me up on social media!